A canapé (pronounced "can-a-PAY") is a type of hors d'oeuvre, or small, easy to eat food, that is traditionally served before dinner, usually accompanied by cocktails. These finger foods were made to be eaten all in one bite and held with one hand. 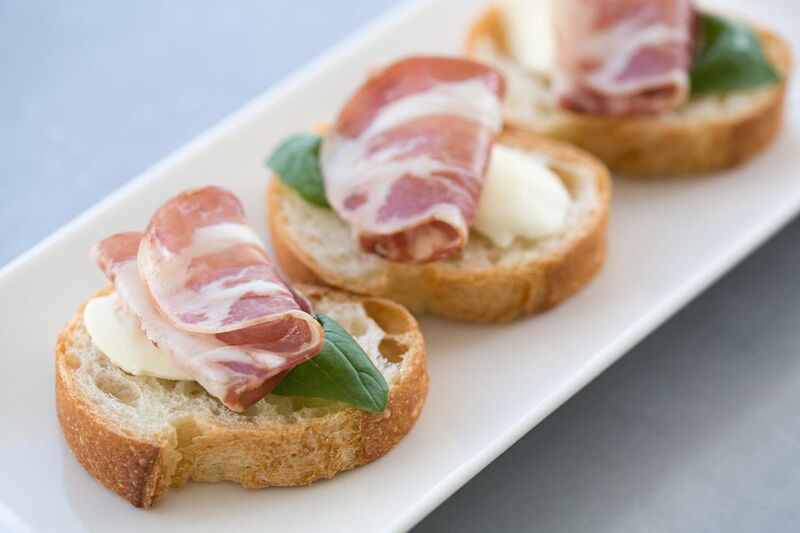 Some people may use the term hors d'oeuvres and canapé interchangeably, but a canapé is a particular subset of hors d'oeuvre that is traditionally made with a base of a small piece of bread with a variety of toppings. Modern canapés may use a cracker, a small pancake (called blini) or even a pastry shell as the base. Crostini is an Italian variation of canapé that has a base made of thin slices of a narrow baguette rather than sliced bread. They're often topped with deli meats like Proscuitto or salami paired with various cheeses. Bruschetta served on crostini is sure to please any crowd. One great way to make canapé bases is by using fluted cutters to cut rounds out of slices of plain white or wheat bread. The two-inch cutter is usually about right, and depending on the size of your slice of bread, you can cut three or four bases out of each slice. Make sure you stay within the crusts when cutting your bases. If you're feeling more whimsical, you can always use shaped cookie cutters as long as they're about two inches. Cookie cutters are a fun way to add some personality to your next cocktail party. Once the rounds are cut out, arrange them on a baking sheet and toast them in the oven at 350 F for five minutes or so. You don't want your rounds too crispy, the toasting is just to them makes them firmer, so they don't start to droop or sag when someone picks one up. Next, you want to spread the rounds with either butter or mayonnaise or a thin layer of cream cheese; this adds flavor and moisture to the dish. The spread also forms a barrier between the bread, and it's topping preventing the bread from getting overly soggy. Finally, we come to the topping. Canapés can be topped with meat, fish, cheese, caviar or some other savory item. The meat can be steak, or prosciutto ham, or lobster or shrimp. The more luxurious, the better. Finish your canapés with a garnish. Often the garnish is what really sets a truly exquisite canapé apart. Usually, it's something small, like tiny minced onions, herbs or slivered red peppers.